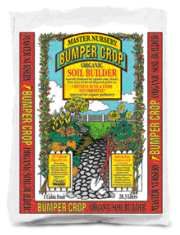 If you are looking for a product to give your gardens a boost mix, Bumper Crop is your soil conditioner. We use and recommend it for all your plantings. It is a great way to help break up the heavy clay soil we have here in Montgomery County and give your new plantings a jump start into your existing soil. Bumper Crop Organic Soil Amendment is super charged with Mycorrhizae, Worm Castings, Kelp Meal and Dehydrated Poultry Manure. Available in 1 and 2 cubic foot bags.